Here's another two pictures I decided not to post about a month ago. 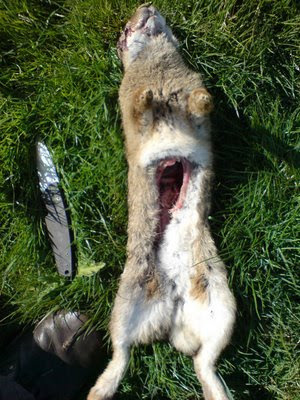 I thought I might write something about the process of gutting a rabbit and illustrate it with some pictures. Then I thought, no, that's a bad idea; someone who understands hunting to be a species of animal cruelty might see them and use them as ammunition with which to shoot hunters - so, I decided, I'd better not post them. Again, good shots. Nothing disrespectful. Honest preparation of honestly earned game, honestly earned sustenance.